Have your hurricane emergency plan up to date. Hurricane season is upon us once again, with peak season between mid-August to late October. These strong tropical storms can leave a wide wake of destruction in their path. Being prepared is your best defense. Identify where you will go if you need to evacuate - i.e., relative, friend, public shelter, etc. Prepare your hurricane supplies-refer to the list provided for guidance on supplies. Stay informed of the latest updates and evacuation orders. Prepare a detailed list of information about the specifics of your medication regime. 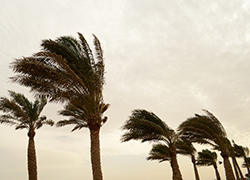 Consult your physician and medical supply vendors to make sure you are adequately prepared for a hurricane. Contact your local emergency information management office if you have any concerns. Wear medical alert tags or bracelets to identify your disability and/or medical condition. Blankets, pillows, sleeping bags, etc. Important documents in a waterproof container – include insurance cards, medical records, bank account numbers, Social Security Cards, birth and marriage certificates, etc. List of important numbers – including your country emergency management office, evacuations sites, doctors, bank, area schools, veterinarian, etc. Stock up on food, water and supplies before the hurricane season starts. Have at least a two-week supply of your medications. Stay aware of weather conditions. Make plans in advance, whether you need to evacuate if you decide to stay. If you need to evacuate, team up with a partner, neighbor or relative and plan your evacuation together. Make plans in advance to stay with friends or relatives living on higher ground.